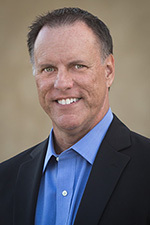 Skype | Richard M. Hicks Consulting, Inc.
With DirectAccess approaching the end of its useful lifetime, many organizations are considering alternative solutions to provide seamless, transparent, always on remote connectivity for their field-based workers. 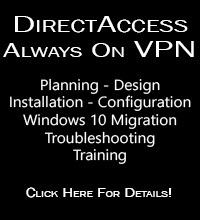 Microsoft is positioning Windows 10 Always On VPN as the replacement for DirectAccess. 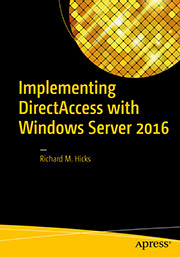 While it provides many new features that were missing from DirectAccess, it has its own unique limitations and shortcomings. NetMotion Mobility is an excellent alternative to DirectAccess and Always On VPN, and it has many advantages over both native Microsoft offerings. NetMotion Mobility offers better security and performance. It provides deep visibility with broad client support, and the solution is easier to support than DirectAccess. If you’d like to learn more about how NetMotion Mobility compares with DirectAccess, you will find detailed comparison information in my Comparing NetMotion Mobility and DirectAccess article series on the NetMotion blog. Watch the following videos to see NetMotion Mobility in action. NetMotion Mobility is a premium remote access solution with many of the same characteristics as DirectAccess; seamless, transparent, and always on. It is feature rich with numerous compelling benefits over native Microsoft remote access technologies. Organizations seeking a solution to replace Microsoft DirectAccess would benefit greatly from NetMotion Mobility. If you’d like to learn more about NetMotion Mobility, or if you’d like to evaluate their solution, fill out the form below and I’ll respond with more information.